Sometimes I think Instagram is good for nothing (unless you consider foodie weddings/group vacation rental parties/storm clouds over skyscrapers as something), and other days it’s great for letting me know that there’s a new Malaysian restaurant down the street hosting a media event where apparently everyone’s eating nasi lemak. What’s this? Pasar Masam on Grand Street? I was there the next day. I wasn’t so sure about Malaysian food in Williamsburg, but I will give the restaurant credit for opening on one of the soupiest weeks of the year. It might not be a real open air night market–the no nonsense back-lit signage advertising multiple permutations of roti is spot-on, though–but they couldn’t have orchestrated the humid monsoon effect any more authentically. I can’t think of a single outdoor meal eaten in Malaysia where I wasn’t sweating to the point of distraction. 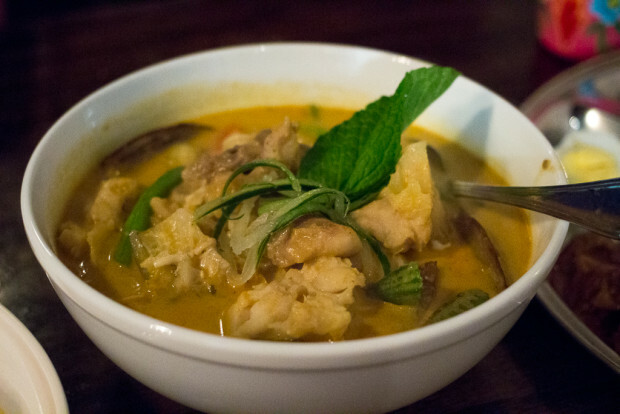 Pasar Malam is from the same owners as Laut near Union Square, the mishmash Thai-Malaysian restaurant you rarely hear much about. Here, there is pad thai, papaya salad and tom yum on the menu, but that’s it. I don’t think they even need it. We’re over saturated with Thai restaurants already and suffering a dearth of Malaysian, especially in Brooklyn. I managed to rope in two others on short notice so I could try more dishes (I’m always amazed at the diversity of food quirks: one doesn’t like hard-boiled eggs, the other eggs scrambled with seafood, i.e. char kway teow and chili crab). I will be back for the meatier things like murtabak. And maybe brunch, which is supposed to happen? The roti station is prominently featured at the top of the menu and in the back of the restaurant, so you can’t really pass on the flaky, grilled pancakes (plus your server–all super invested in your trying and liking the food–probably won’t let you). 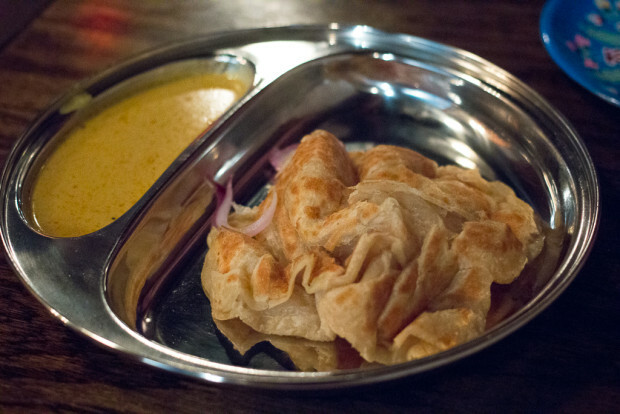 Roti prata is a slightly thicker, chewier version of the more-common-in-NYC roti canai, and served with a thin lightly spiced curry, no chicken or potato chunks. One person could easily eat a serving themselves, and might want to, but only make that rookie mistake if you don’t plan to order much else. 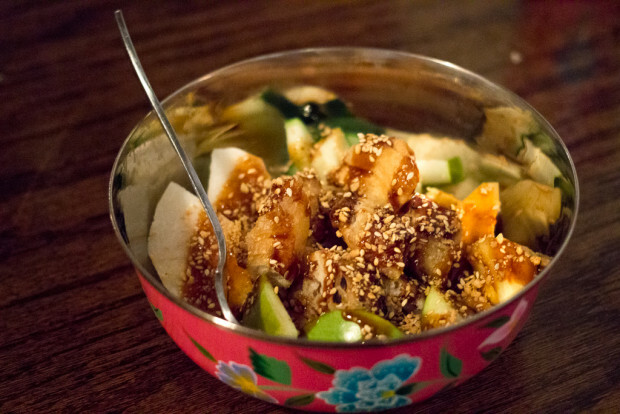 Rojak isn’t a superstar with the name recognition of satay, or even laksa, but the salad exemplifies Malaysian flavors with its sweet-savory balance that teeters on weird. Ostensibly, it’s a crunchy fruit salad, made up here with pineapple, green mango and apples, but also cucumber and jicama, plus chopped up fried cruellers for a little chew (I like the versions that also include squid for even more chew). The whole thing gets dressed in a thick, burnt umber shrimp paste dressing (I could’ve used more) that’s like a fishy molasses and garnished with sesame seeds and crushed peanuts. Mexican fruit preparations with salt, chile and lime get at this odd combo, Thai papaya salads with dried shrimp, a little palm sugar and fish sauce get pretty close, but nothing really reaches the fruity-fishy intensity like rojak. 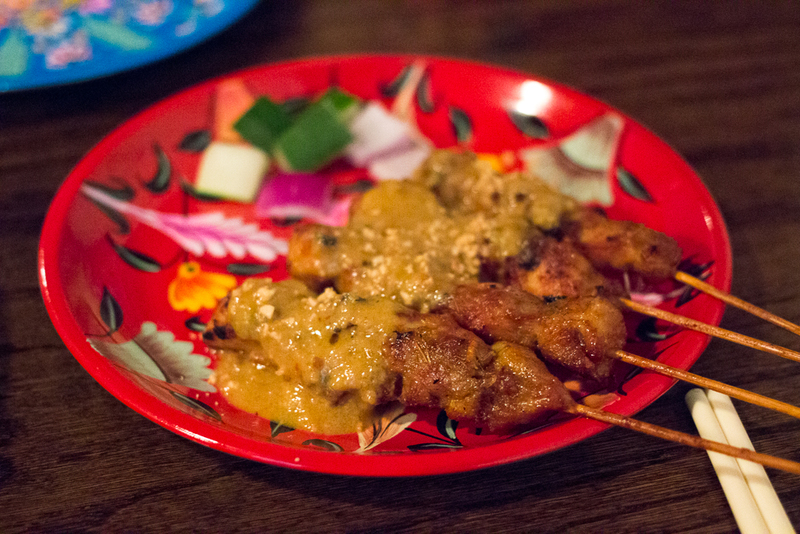 Satay always seems boring to me, but the classic grilled chicken with peanut sauce was sweet, smoky and in appropriately demure-sized chunks to retain moisture. While the flavors aren’t watered down and I wouldn’t really call this nouveau anything, there are some creative liberties taken–the Hainan chicken rice being fried rather than steamed may give some pause–for instance, our server really wanted us to try the tandoori satay. Who knows? It’s probably good? If you want serious liberties taken, look no further than the new Burger King Malaysia tie-in with the latest Transformers movie. This potato chip-topped hot dog could give a Colombian perro caliente a run for its money, if not for the chicken wiener. And as if to be proven wrong in my know-it-all self-sufficiency, we were brought a butter garlic prawn each after ignoring the glowing recommendation. 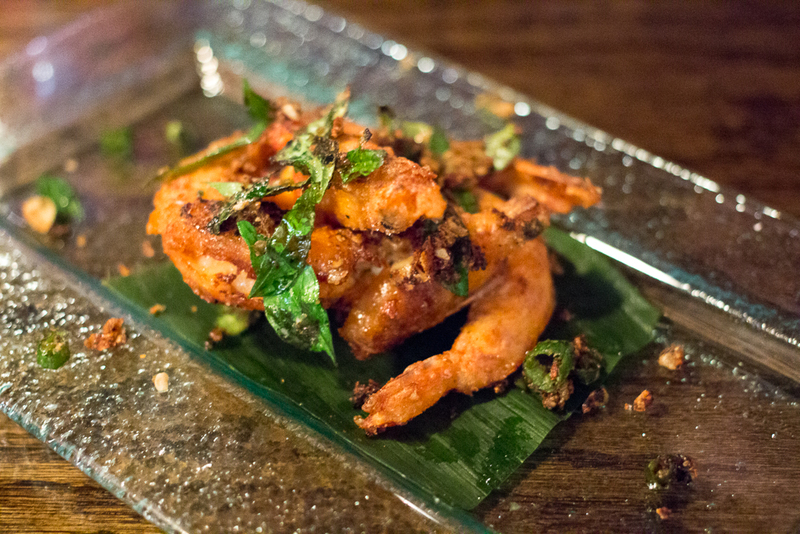 Yes, they were good, really good, and like a spicier, curry leaf-fragrant version of salt-and-pepper shrimp. To be honest, after you’ve had chili crab twice in your life, the novelty wears off and you might just move on to less messy dishes that don’t require extracting precious morsels from goopy shells. That was why I was not bothered by the use of soft-shell crab in the Singaporean classic. The sauce leaned more sweet and sour than spicy, as tradition dictates, and really the egg just gives it body a la egg drop soup minus the massive amounts of corn starch. Thankfully, no one messed with the accompaniment: fluffy mantou, available steamed or fried. Don’t think that I didn’t notice that orange chile ring artfully placed on the tip of the battered leg. The other thought I had when first seeing photos online of the conical mounds of coconut rice was that Pasar Malam was really going to mess with my plan to not eat (I said nothing about drinking) any carbs until my birthday, 23 days into the future. Clearly, I caved before I barely began. 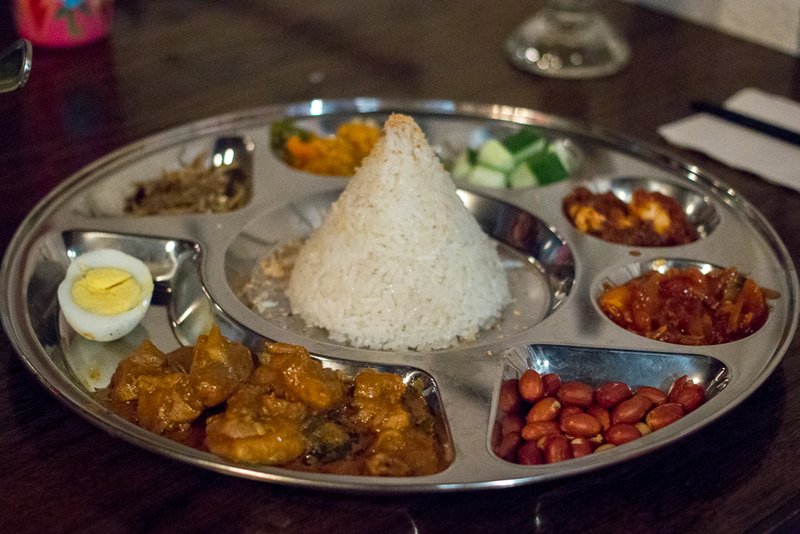 More than just some curry, rice and a few fried anchovies and peanuts tucked into a banana leaf package to go, this was serious sit-down dinner-style nasi lemak. The chicken curry also comes with multiple shrimpy, fishy sambals, pickled achar–and that requisite hard-boiled egg half. I’m not convinced that Williamsburg is full of the educated eaters the owner thinks there is, but I do appreciate the presence of a fish head curry. And yes, I was warned it was a fish head. And yet I was dismayed by the lack of an actual head, eyes intact, cheeks for the picking. It comes pre-hacked, which actually makes it fussier to eat, necessitating a lot of sucking gelatinous bits from nooks and crannies rather than being able to dig in yourself with chopsticks from a more stable mass of flesh. Served with okra and green beans, this is a creamy, coconut milk-based version, not the hotter, orange-tinged broth style. There is no liquor license yet. 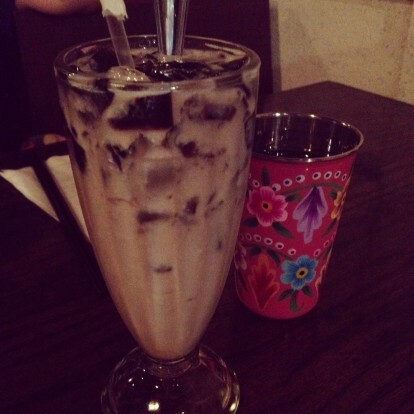 There is a Michael Jackson, though, my favorite un-PC name for the popular black-and-white soy milk and grass jelly drink. Pasar Malam has made me a little excited about Brooklyn dining, something I had been feeling jaded about recently. I’m only sad that I finally got an interesting, non-meatball/bbq/fried chicken restaurant so near to my apartment, mere months before I move to Queens. Nice knowing ya. menudo (for some reason tom yum doesn't appeal) or Singapore laksa, a.k.a. and too beat to walk the eight blocks to the nearest drug store. the menu." What's wrong with the bauernwurst? the calves liver with apples and bacon, thankfully. comes with a big mound of scrambled eggs, shrimp and cilantro. fontina (spelled fontana) and prosciutto panini; it'll endear the older bartender who's also midday tippling to you. If you're a certain age being referred to as a "good girl" isn't offensive. your turn when you can just be a twentysomething in Williamsburg? As much as I love the malls of Asia and organized hawker centers, there is something to be said for the weak breezes of an electric fan while sitting on hard wooden booth in a well-worn shophouse. Cooling off with an ais kacang, of course. Kek Seng is perfect for a traditional Penang experience…like putting vegetables and legumes in desserts. This bed of shaved ice came smothered in creamed corn, rose syrup, red beans, a layered agar-agar jelly and best of all two scoops of durian ice cream. The durian ice cream, which does have a distinct natural taste unlike some duller durian-flavored sweets, is optional. You shouldn't pass it up, though. Cooked food is available from the stands out front. Having started with the Gurney Drive hawkers, then moving onto more modern Northam Beach Café, New World Park was the next logical step. Only a little over two years old, this complex is home to casual upscale restaurants like Shanghainese Rou Gu Cha King and Sri Batik Nyonya Café, as well as this tidy hawker center, all signage homogenized into one distinct style. The popiah stand was popular and I hadn't tried any on this vacation. I'm not sure if it's the nature of popiah or just this version, which were freshly made on the spot, but I found the rolls kind of bland. I think it was the jicama-heavy filling. We ordered roti canai from the Indian Muslim stall. The sauce was redder than anything I've encountered in the US, and I think vegetarian. Then again, roti canai here isn't the same since most Malaysian restaurants are run by Chinese. And a shrimp fritter too. James ordered char kway teow because…he usually did in Penang. 1/2 Our last night in Penang, I went back to Gurney Drive to try the pasembur that I missed the first time. Sadly, the stall wasn’t open and on this weeknight, only half the seating was out creating a madhouse, scrambling for tables effect. What else was nearby? We walked down to Bali Hai, a sprawling outdoor seafood restaurant with a flashy neon sign and a wall of choose-your-own-creature fish tanks. Also, popular in Hong Kong and Singapore, I’d always shied away from this style of dining because quickly calculating grams to ounces while simultaneously doing currency conversions makes me nervous and I’m paranoid that I will end up with a massive bill. This did end up being our most expensive meal in Penang but even with three large sharable Calsbergs (the territorial aspect of SE Asian dining always throws me. When approached by the Indian woman dressed in a green miniskirt ensemble we asked for Tiger beer, but she was the Carlsberg server. You had to order from the Chinese Tiger beer girl if you wanted Tiger. Meanwhile, there was a rogue satay guy who didn’t seem to have any affiliation with the restaurant) it was under $50. The covered open space, sticky despite fans blowing water, was filled with large round tables, many occupied by groups of men, coworkers, showing a Westerner, maybe a boss, maybe a peer, a good time. The primo spots were thatched hut booths in the front. We had a roomy picnic-type table on the outer perimeter. Mantis prawns. I’ve always wanted to try these giant crustaceans, despite their creepy name and buggy, armored appearance. Not inexpensive, these were about $10 apiece. The impenetrable shells come scored, diners are brought scissors. I copied the guy at a table near ours and scraped out the meat with a spoon. It turned out to be a lot of work for not a lot of payoff, like blue crabs. The chili sauce was barely touched because I couldn’t wrangle any tidbits substantial enough for dipping. Here are some live mantis prawns in action. As you can see, they also had quite a selection of geoduck. The prehistoric-looking animals are often touted as a Northwest delicacy but I never encountered them in Portland and have still yet to try them. 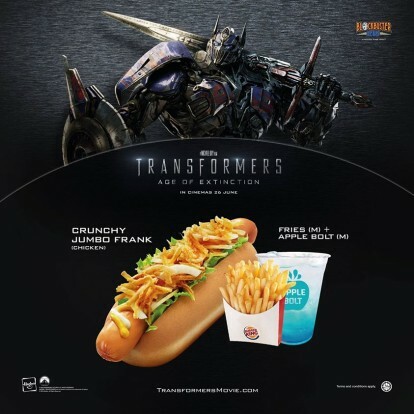 I’m not sure how they are served in Malaysia. Kang kong, a.k.a. water spinach, prepared with shrimp paste and chile is a typical Malaysian vegetable. Accents are very subtle. Our waiter, who had to be sent over to our table because he was the only fluent English-speaker, had no idea what I was asking for when I said kang like in kangaroo. A’s are softer like in almond; his pronunciation was more like kong kong, the A barely different from the O. My pronunciation of pandan was corrected on my last visit to Malaysia, so you think I would’ve remembered. Normally, I hate stems and try to avoid them raw. This style of water spinach is so savory and hearty that I forgot about being scared of the hollow stems. I picked out a sea bass that would be good for two, like I said, grams don’t mean anything to me visually. This fish, fried to a crisp, was amazing and almost Thai in flavor. It was served with a very spicy green mango slaw and lots of shallots and mint leaves. Despite a substantial amount of blog posts and having their own website, I have no idea what Bali Hai’s address might be of if they even have one. Such details seem superfluous in much of Southeast Asia. 1/2 I try to be open minded about others’ food limitations. Even so, I will admit that while at a sushi lunch with a few workmates the other day, I was stunned to hear that crème brulee was something that one coworker’s new husband reluctantly tried for the first time on their recent Disneyworld honeymoon. “Um, that’s a delicious dessert, not something weird,” added the other luncher. Indeed. While I don’t go in for the gross for the sake of being shocking antics, if a dish traditionally contains un unusual ingredient I definitely want to eat it the way it was intended, not toned down for delicate sensibilities. If it turns out to be loathsome? Lesson learned. So, maybe I was being sneaky when I ordered two bowls of curry mee at Lorong Seratus Tahun, nodding yes to all of the mix-ins. I knew full well that James wasn’t going to be as enamored of pig’s blood as I. “Should I even ask what this is?” he hesitated, poking at the jiggly crimson cubes. “Kidneys? Heart?” I had to break the bloody news, but countered that the texture isn’t much different than tofu. Oh, that’s right, he doesn’t like tofu either. I ended up with a double-dose of pig’s blood cubes. Anyway, I loved this soup. Even though Penang laksa had undeniable hot-sour charms, I always fall for the spicy-creamy coconut milk-based soups. As you can see from the color of the prawn-enriched broth, they use a light hand with the coconut milk. This isn’t lemak as the curry laksa that’s more common in Singapore. The fried bean curd puff soak up the flavor, cockles, shrimp and squid (not sure if that’s common or not) add chewiness from the sea and the coagulated pig’s blood? Yes, that is unusual. I suppose Portuguese combine shellfish and pork in delicious ways. Just as I can’t even imagine how it was decided to combine cuttlefish, fruit and prawn paste in rojak, I don’t how the idea of putting pig’s blood into a seafood-based soup came about either. Definitely a Chinese influence, and far from wasteful. Two types of noodles are used, both fat yellow egg noodles and rice vermicelli. You can add as much sambal as you like for extra oily spice; containers are left on the table. I have been thinking about this bowl of curry mee off and on for the past few weeks, usually at work when I try to calculate if I have enough time to hop up to Chinatown and back during lunch. I’m not even sure where to go downtown. Nonya? New Malaysia? Skyway? 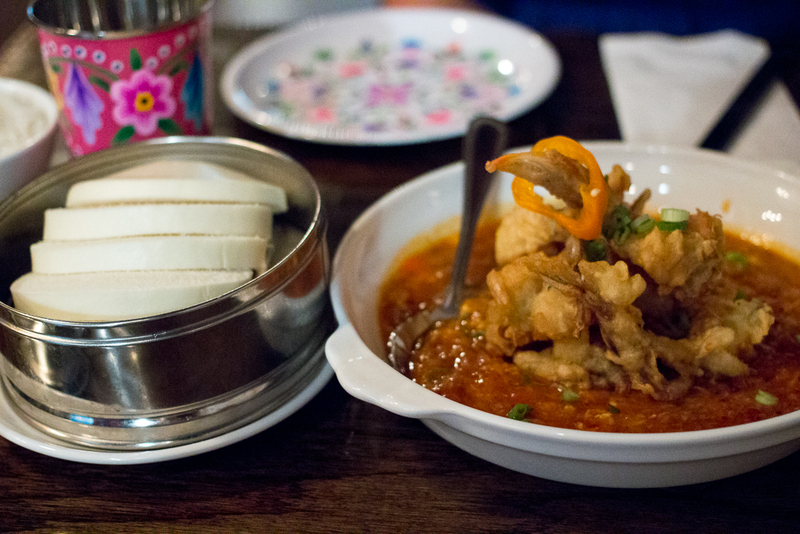 Malaysian food in NYC often seems like a facsimile in ways that are harder to pinpoint than with American Thai food. I think it just comes down to ingredients and lack of a strong Malaysian/Singaporean presence in the city to keep flavors on track. I’ve had positive experiences at Taste Good in Elmhurst but that takes more planning. As the check was brought at the close of my sushi lunch, a send-off plate of cantaloupe showed up instead of the usual orange slices. Payback time. After discussion of crème brulee and pig’s blood fears, I was faced with my own irrational won’t-touch-it dislike: melon.